Beattie's Book Blog - unofficial homepage of the New Zealand book community: NEW ZEALAND ENGLISH: IS THERE MORE HERE THAN MEETS THE EYE AND EAR? NEW ZEALAND ENGLISH: IS THERE MORE HERE THAN MEETS THE EYE AND EAR? New Zealand English is not all about afghans, interisland fairies, Palmie, and the puckerooed old bach down South! It was only in the late twentieth century that New Zealand English became widely recognised as a distinctive variety of English and distinguishable from Australian English. Before then, it was frequently regarded as an Antipodean form of slang and informal language. What geographic and social conditions have produced our distinctive form of English, and how has it been regarded within the nation? This illustrated talk examines the areas of our society that contribute new words, and how these influences, and the words themselves, have changed since early European times. We see how gathering these words together in a dictionary or lexicon, with examples of their usage, provides a remarkable social and cultural history. 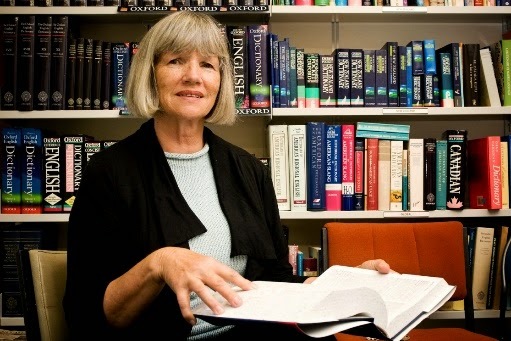 Until recently, Dianne Bardsley was Director of the New Zealand Dictionary Centre and lecturer in the School of Linguistics and Applied Language Studies at Victoria University, specialising in historical New Zealand lexis. She has compiled seven dictionaries and thesauruses with Oxford University Press and is the author of In the Paddock and On the Run (2009) and Book of New Zealand Words (2013). Time: 12.15pm on Wednesday 3 September 2014. Place: Ministry for Culture and Heritage, L4, ASB House, 101 The Terrace, Wellington. Talks are for approximately one hour. To listen again to MCH History talks go to: http://www.nzhistory.net.nz/handsonhistory/downloads-and-podcasts.